We had a blast last night at the "Things I Love" class, and here are a few of the cards we made, ENJOY! 2 more winners from last week! As part of my April's 8th year Anniversary specials, 2 more customers have won stamp sets from me from last week! Dianne H. (who attended 2 classes) and Sharon P. (who placed an online order) have each one their very own "Things I Love" set... my featured set of the week! "Things I Love" class... coming Wednesday! 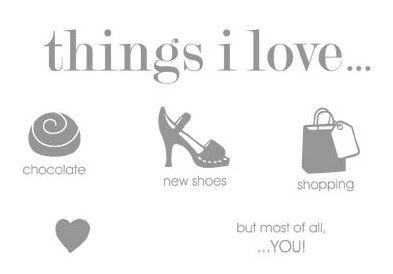 The main loves of any woman's life are simple: shopping, new shoes, and chocolate! But most of all, show the loved ones in your life that you love them more than chocolate with the darling images from the Things I Love 6 piece stamp set. Join me on Wednesday April 28 at either 1pm or 7pm for a great class, where we'll make 4 different cards with matching envelopes using these adorable stamps. COST: $34.95 for class (includes 6 piece “Things I Love” stamp set, $20.95) or $19.95 for class only. RSVP your spot! More cards for Saturday's Family Cards Class! Are you joining us this Saturday for our Family Cards class at 1pm? We're making 2 masculine, 2 feminine and 1 child card... perfect to give out when you need them to aunts, nieces, step-parents, grandchildren, whoever! Also another reminder to my Canadians, INK! team gals that our monthly gathering is here at the studio on Saturday evening at 7pm. Be sure to RSVP so I can have all the Make & Take projects and draw prizes ready for you! New class coming... Family cards! Next coming Saturday at 1pm, I'm hosting a "Family Cards" class where we'll make a total of 5 cards: 2 masculine, 2 feminine, and one child... perfect to customize for the family members in your life! The beauty of a card like this is that it can also easily be transformed from just "Mom" to Step-mom, Grand mom, Mom-in-law, using the "Wonderful Favorites" set! Winners of Week 2's stamp sets! As I continue giving away free stamp sets as part of my 8 year Anniversary special with Stampin' Up!, it was great fun to give away 2 more this week! Here are Mary & Dianne, who each won a new set! One more "A Flower for All Seasons" card! Here's another cutie card we are making as part of this stamp set's class. The fun thing is that you can easily change the sentiment to something you like... because "Teeny Tiny Wishes" has 24 different ones to choose from! If you aren't able to make it to the Saturday class, you can still join me on TUESDAY at 1pm -- just RSVP to hold your spot. Other details from the card include the Sweet Pea designer paper, and the ribbon is from the "Orchard Ribbons Original" set. By the way, April is the LAST month that you can order the beautiful Sweet Pea Designer paper stack, as well as any of the other items from the current Occasions Mini catalogue. Be sure to contact me soon to get yours! 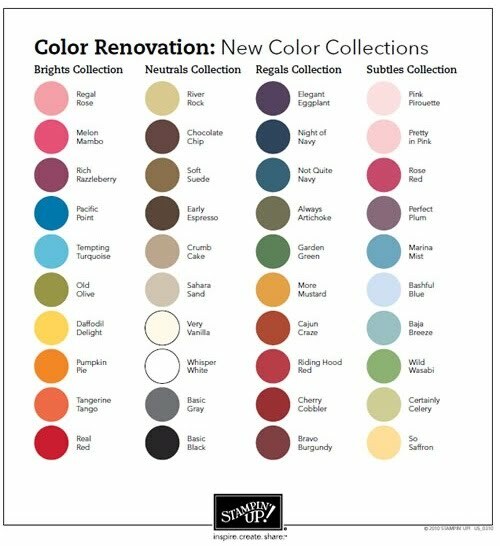 More about the new upcoming Color Renovation! The following 30 colours are being RETIRED from Stampin' Up! 's colour palette. Be sure to NOT wait until June to order your ink refills, ink pads, and cardstock... you may not get what you want. 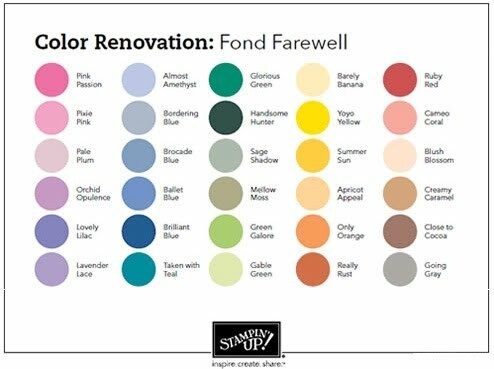 If some of the farewell colours are your favourites, please place your order soon so that you won't run out and miss them! Come and make 10 "So Cool" Rub-ons cards! This Wednesday at 1pm and 7pm, I'll be hosting a "So Cool" Rub-ons class, where we'll be making 10 great cards with matching envelopes! These fun and whimsical cards are great for giving to people of all ages, so be sure to not to miss it. Please RSVP for your spot - class includes your pack of "So Cool" rub-ons as well, for $29.95. Winners of Week 1 of my Anniversary Special! 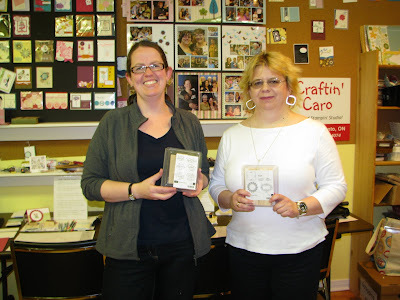 As I am celebrating my 8th anniversary with Stampin' Up! this month, I'm giving away 8 stamp sets as part of my many specials! Each week, I'll draw 2 lucky winners from the people who either placed orders with me that week or attended a class. Jenette K. - who won the level 1 Hostess set "Picture This" Mary V. - who won "Tart & Tangy"
If you are getting fed up with the rain outside and want to come out to play, join me on Wednesday, Thursday or Friday night for some stamping fun! This is the new Awash with Flowers set, using several of the soon-to-be retiring colours (Pink Passion, Gable Green, Only Orange, Lovely Lilac, Bermuda Bay). I bought mine in the clear mount, and there are so many images that it needed to come in 2 cases... just $36.95 CDN for this 18 piece set (clear)! The sentiment comes from the Messages for Mom set from the Occasions Mini catalogue, only good until the end of this month. Card 2 uses the "Fifth Avenue Floral" set, part of the 20% off promotion so now only $26.36. I paired the retiring Blush Blossom and Cameo Coral colours with Rose Red, and chalked the flower lines. The sentiment is from Warm Words, my go-to set for small words! Come and make all 3 cards with me... your class is FREE with a $25 order placed that night, so just RSVP and then come on by!